What Sky Flight lacked in experience he made up for in talent when he surged late and ran down the 25-1 Cement Clement to register a one-length victory making his stakes debut in Saturday’s $100,000 Tropical Park Derby at Gulfstream Park. Sky Flight, making just his fourth career start, scores by a length under Jose Lezcano in the Tropical Park Derby. Sky Flight entered the 1 1/16-mile turf stakes having made only three previous starts as far and away the least experienced member among 12 3-year-olds. But under a perfectly judged ride from Jose Lezcano, Sky Flight rated well off a swift early pace, steadied briefly looking for clearance entering the stretch, accelerated suddenly once finding a seam between horses at the head of the lane, and wore down the leader to win going away. The winning time over firm turf was 1:40.25. In a field seemingly loaded with speed, Cement Clement controlled the pace after setting lively fractions of 23.31 and 46.02 seconds for the opening quarter- and half-mile. The Penn National-based Cement Clement remained well clear at midstretch but could not contain Sky Flight’s final bid. 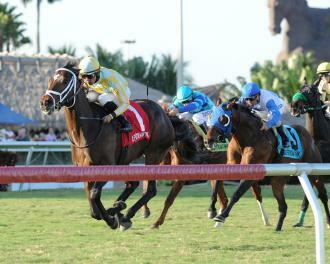 He did continue on gamely to finish second, a length in front of 5-2 favorite Smooth Daddy. Sky Flight, a son of Sky Mesa who didn’t make his first start until September, paid $11.40. Sky Flight is trained by Mark Casse for owner John Oxley.